World Meteorological Day takes place every year on the 23rd of March and commemorates the coming into force on March 23rd 1950 of the Convention establishing the World Meteorological Organization. It showcases the essential contribution of National Meteorological and Hydrological Services to the safety and wellbeing of society and is celebrated with activities around the world. 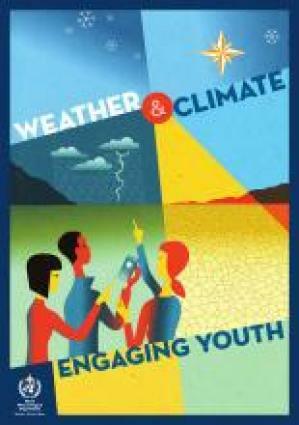 The themes chosen for World Meteorological Day reflect topical weather, climate or water-related issues. 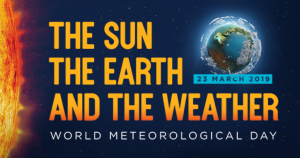 The theme for World Meteorological Day 2019 is “The Sun, the Earth and the Weather”. The Sun delivers the energy that powers all life on Earth. It drives the weather, ocean currents and the hydrological cycle. It shapes our mood and our daily activities. It is the inspiration for music, photography and art. The Sun is located some 150 million kilometres (93 million miles) from Earth. The Sun’s diameter is about 1.39 million kilometres (864,000 miles), or 109 times that of the Earth. At its core, its temperature is about 15 million °C. The surface of the Sun – the part we can see – is about 5,500 °C. The Sun’s volume would need 1.3 million Earths to fill it. The Sun’s rotation period at the Equator is about 27 days and at the Poles about 36 days. A solar eclipse happens when the moon comes between the Sun and Earth. When the moon only blocks out part of the Sun’s light, it’s called a partial solar eclipse. Sometimes, the moon blocks all of the Sun’s light. This is called a total solar eclipse. The word Equinox comes from the Latin equi (meaning ‘equal’) and nox (meaning ‘night’). The spring equinox marks the beginning of Spring and from this day forward the day is longer than the night. Similarly the autumn equinox marks the start of autumn as the night becomes longer than the day. The equilux is when day and night are equal and occurs a few days before the spring equinox, and a few days after the autumn equinox. Ireland normally gets between 1,100 and 1,600 hours of sunshine each year. The sunniest months are May and June. During these months, sunshine duration averages between 5 and 6.5 hours per day over most of the country. The extreme southeast gets most sunshine, averaging over 7 hours a day in early summer. December is the dullest month, with an average daily sunshine ranging from almost 2 hours in the extreme southeast to just 1 hour in the north. Over the year as a whole, most areas get an average of between 3.25 and 3.75 hours of sunshine each day. The tendency for coastal regions to record more bright sunshine than inland areas is the result of the convective development of clouds over land. This daily development of cloud is due to the vertical air currents as a result of thermal heating of the ground. Upland areas are also prone to low values of bright sunshine because of greater cloudiness especially on slopes facing the prevailing winds. The most important variations of daily bright sunshine are due to seasonal changes corresponding to changes in the sun’s elevation. The mean daily bright sunshine at Rosslare is almost 1.9 hours in winter, 5.3 hours in spring and 6.1 hours in summer. 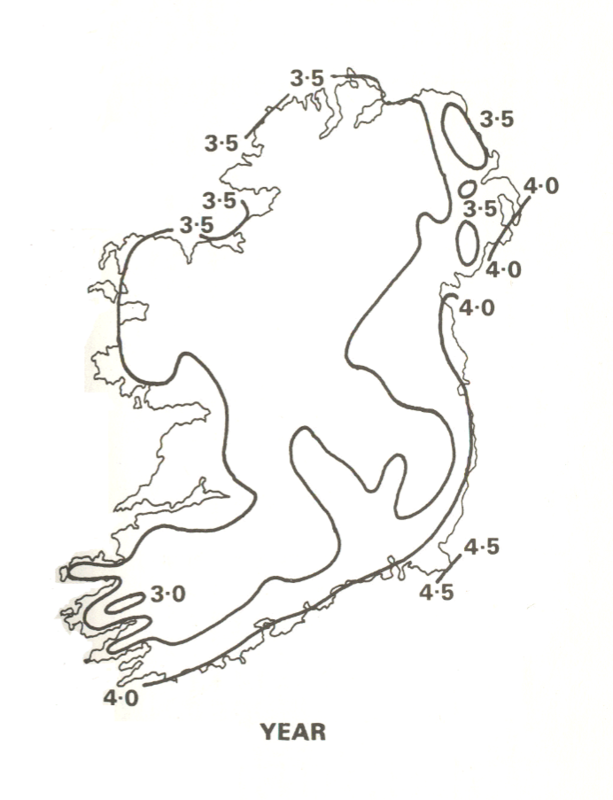 The sunniest part of Ireland is the far southeast. The southeast tip of Wexford gets an average of 4.5 hours of sunshine per day while mountainous areas in the west of the country get only 3.0 hours per day. 2020: “Climate and Water”, which will align with the theme of World Water Day 2020, focusing on climate change and water. 2021 (proposed): “The ocean, our climate and weather” in conjunction with the launch of the United Nations Decade of Ocean Science for Sustainable. Happy World Meteorological Day March 23rd!